that have been elected by more than 100 million votes to represent global heritage throughout history. 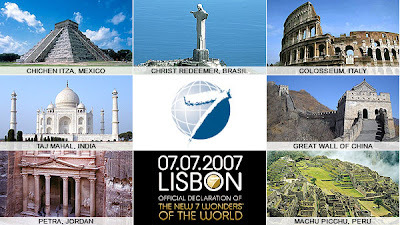 All The Official New 7 Wonders of the World are equal and are presented as a group without any ranking. I actually voted in this one way back in 2007 and was rooting for Angkor Wat and Eiffel Tower being places I've been to at that time. if there's one that i'd seriously want to go to, it has to be machu picchu. other than it's in the mountains, i have a feeling the place gives of a creepy vibe. Gonna vote for Machu Pichu! Woot! I really wanna go to Italy.. I love old and historical places. I hope I could visit any one of them in the future. want to visit these all..yay! Hope I can visit at least one of those places. Seems awesome. Yeah i wish to be visiting all of them, love it! Taj Mahal deserves the first place. It's an amazing piece of art! hope i can visit one of this 7 wonders very soon! I am planning my lists of where to go and choosing of this wonders of the world is very hard! I strongly believe that the majestic Roman Aqueduct of Segovia should be included in the 7 wonders of the world.